It's no surprise that notebooks, Ultrabooks and tablets were pretty much the flavors of the day here at CeBIT, and we've already picked out a few choice selections. So, we're bringing you a second OEM Android tablet, but we liked the sound of it so much, we just had to give it a try. Chinese manufacturers certainly seem to be embracing the 9.7-inch form-factor, and that's what we have here. That translates to a 1024 x 768-pixel display, which benefits from in-plane switching (IPS) for improved viewing angles. Sadly, it's another absolute fingerprint magnet, so you'll need to keep your cloth handy or learn to live with it. We barely handled it at all, and we'd already given the feds enough to catch us several times over. The innards are pretty modest, with a "Boxchip" A10 1.5GHz processor, 512MB of RAM and 4 gigs of internal memory, but it seemed to run just fine. We were handling an engineering sample at the show, which meant there were a few visual blemishes, but reps promised that they won't find their way into production versions. Unlike other budget (and some not-so-budget) slabs, this one has a 2-megapixel front-facing camera, and a relatively impressive 5-megapixel shooter around the back, supported by a 6,000mAh battery -- which the makers promise provides up to 8 hours of use. Getting out on to the internet can be done via WiFI (802.11b/g/n), or over 3G by popping in a SIM. The all-plastic finish has a few quirks, like the power button sitting next to the camera, but it doesn't look all-together bad given what you're paying -- well, what OEMs will be paying, at least, considering that this tab won't be shipping directly to consumers. As always, we took it for a quick spin, which you can see in the video just after the break. 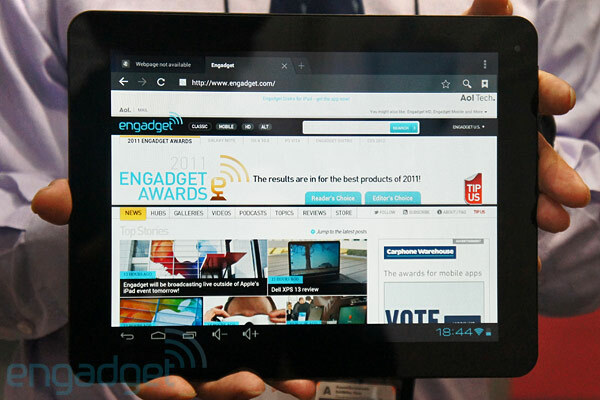 Viota ICS tablet has 9.7-inch IPS display and costs $120 wholesale, we go hands-on (video) originally appeared on Engadget on Wed, 07 Mar 2012 12:12:00 EDT. Please see our terms for use of feeds.